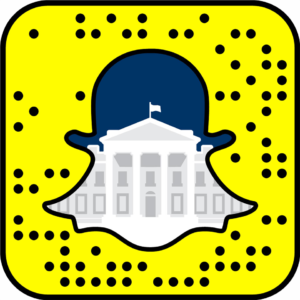 On January 11, 2016, the Obama White House announced their new Snapchat account. In their announcement, the Office of Digital Strategy said this expanded their efforts “to provide the American people with a multitude of ways to engage with their government.” Images and videos were posted to the White House “story” on Snapchat, which were available for 24 hours to anyone who followed the account. The White House documented events including sports teams visiting the White House, the White House Easter Egg Roll, and domestic and international trips. These posts provided a “behind the scenes” look and occasionally featured public figures discussing what they were doing. The White House use of Snapchat further expanded the possibilities and reach of the digital presidency and complemented use of Facebook, Flickr, Google Plus, Instagram, Pinterest, and Twitter, which are archived at http://obamawhitehouse.gov.archivesocial.com/. In sum, there were 1,206 posts, shown below in a 10 minute video. Since it was not possible to capture the full video post, I included screenshots of the video posts, which are slightly blurred, along with the image posts. The music for the video were the songs “Seven,” “Happy Together,” and “Juncture” by Dexter Britain, which are licensed under a Creative Commons Attribution-NonCommercial-ShareAlike 4.0 International License. The full zip file is available here (Note this file is large, around 1.6 gb). The image file names are the time I took the screenshot in chronological order. For example, “0001 White House SC 2016-01-11 PM 6.27.50” means I took the screenshot on January 11, 2016 at 6:27 pm (eastern). Snapchat changed their app settings late March 2016 adding a “X minutes ago” mark in the top left, which means you can determine the exact time the image was posted. The January and February posts could have happened at any time in the prior 24 hours of the file name.